I am glad to announce that I have now joined the league of Internet Big Boys. You may be wondering what I am on about now. Well, I have finally been able to map my domain (www.haroldwrites.com) on WordPress. Prior to now, my blog url was http://www.haroldwrites.wordpress.com . Too long and boring, right? I know. I know. On January 15, 2014, I wrote a blogpost on the importance of getting a custom domain. You can read that post here: It is titled “5 Things Every Serious Writer Should Do in 2014”. After writing that, I proceeded to register the domain http://www.haroldwrites.com on Namecheap in 2014, but I was unable to map same to WordPress so it could become functional. For my readers who are like me and aren’t that techie techie, let me break down some words I have used so far. Words like “url” “domain” and “map”. I’ll try to do that like the amateur that I am, so please, all ye internet nerdy guys who know “wazup”, don’t laugh at me. A URL stands for Uniform Resource Locator. It is your internet address. A domain on the other hand, is also an internet address, only that this time, it is a unique internet address. Let’s use car plate numbers to illustrate. Every car owner has a general plate number recognized and issued by the State, say “DV 279 KJA” in Nigeria. Every plate number must have the first set of two alphabets, followed by numbers, and then, three alphabets. Everyone with a car has a “URL” in this sense. But the Big boys who want to stand out from the crowd, go ahead to customize their plate numbers. For example, you change from “DV 279 KJA” to “KING WIZZY” when you hit your first billion. In this sense, you’ve got a customized “domain”. To “Map” a domain basically means to re-direct, say, your old plate number to your new plate number whilst maintaining the same car. Whilst you register your custom domain on one platform (Namecheap for me), you may want another platform to host that domain (WordPress). Don’t get me wrong; you can buy and host a domain on one platform. If you do this, there would be no need to “map”, but if you use different platforms (to register and then, to host), you would need to “map” your domain so that, your customized domain will become functional. I chose to use different platforms. Want to know why? Bring your ear closer. *Whispers* I heard it is cheaper that way. Now, whether this is true or not as at today, I don’t really know. But back then, it used to be true. I checked. Okay, I just checked again. It is still true. Registering a .com domain on Namecheap is about $11 (for the least package). Hosting that domain on Namecheap’s cheapest package is about $10 for the first year, and about $39 for yearly renewal. So for a first timer, you would pay about $21 (to register and host only), but to renew, you would pay about $50 (if my calculation is correct). But if you choose different platforms to register the domain and host(say Namecheap to register and WordPress to host), this is what you will have to pay. Getting the .com domain on Namecheap cost about $11. Mapping it to your WordPress account/blog cost $13 on WordPress. Put together, that’s about $24. I was saying I tried mapping my Namecheap registered domain (www.haroldwrites.com) to WordPress in 2014 to no avail. The reason I could not map same to WordPress was because my Nigerian debit card was declined by WordPress on several occasions. They weren’t accepting cards from Nigeria (I think) and I did not have a Paypal account. I talked about it in this post. Two years after that, on January 01, 2016, I wrote another blogpost titled: “2016: The Year We Break Things?” In that post, I blogged about having a registered domain which could not be mapped. So I had a situation where I had a registered and paid-for domain (www.haroldwrites.com), but I could not utilize same because my preferred host, WordPress, rejected my Nigerian debit card. The domain (www.haroldwrites.com) expired last year ( 2015) and I renewed it for another year on Namecheap – of course, paying another sum for that. So, for two years, I paid for a domain I was not utilizing. You might be wondering why I kept paying for and reserving a domain (www.haroldwrites.com) I was not utilizing. Well, there is something unique about that domain. At least to me. 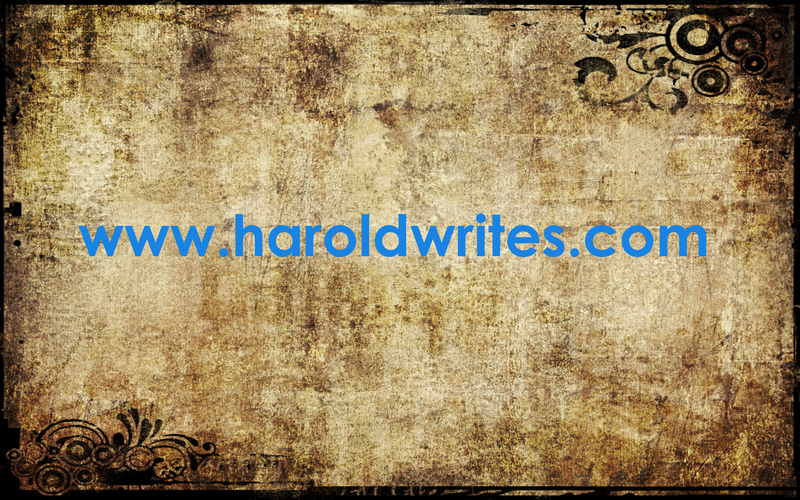 For one, since I started this niche blogging in 2012, I started with (www.haroldwrites.wordpress.com). I felt the “writes” added to my name “Harold” perfectly portrayed what and who I am all about. I love making up stuff with words, even if most of the times, the things I “write” end up staying in my head. Or my heart. I could be on a romantic date and I’ll be making up a story in my head – a story inspired by my date’s terrible make up. Or the Pastor could be preaching on a Sunday morning and I may not be able to stop thinking about how his shinny red tie would be the perfect metaphor for a story. So yeah, I love making up stuff with words (be they written or just thought-up). When the time came for me to settle for a URL name that best described me (I had operated several other aimless blogs in the past), it was not hard to pick “haroldwrites.wordpress.com”. When the time also came for me to pick a custom domain, you could imagine the only one on my mind. WordPress offered me personal options like “haroldwrites.me” but I kissed my index and middle fingers and told them “Peace”. So today, for some weird reason, I saw myself going through my WordPress dashboard and I saw the “Domain” bar (as I always do). For some weirder reason, I decided to once again, try my luck at mapping my already registered Namecheap Domain. To my utter surprise, it worked. So Ladies and Gentlemen, I present to you, my new blog URL: www.haroldwrites.com . The old URL (www.haroldwrites.wordpress.com) still works, though. Any search to that URL will redirect to www.haroldwrites.com . Let me go and edit the “About Me” page on all my social media platforms to reflect my new blog address. I have now joined the league of Internet Big Boys. I’m just waiting for the money to start raking in to solidify my Big Boy Status. Now I know those who don’t mean me well. Deb, I left you a message on Twitter about your blog. Thanks Oge. You’re next. We’re rooting for you. Haha. I think I know who this is. Thank you sir.